We have an extensive experience in designing and building unique systems geared directly for the customers proprietary requirements. We understand how your unique requirement are specific and confidentiality in regards to your requirements are the utmost importance. Please feel free to contact us regarding how are experience in developing unique solutions to your processes. Some of our standard filter manufacturing equipment includes a multi station Hot Plate for the assembly of Dust Collection Filter Cartridges. The system incorporates a unique, height adjustable, low clamping system to ensure maximum contact with the heating element, without damaging the filter element. 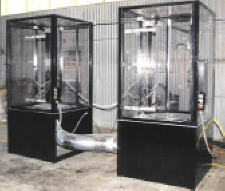 A Flame Retardant Spraying System for the post processing of Dust Collector Filter Cartridges. System consists of rotating spindle bases with a PLC controlled metering system to ensure accurate fluid volume dispensing as well as even coverage of the Filter element. We also have extensive experience in web handling systems. 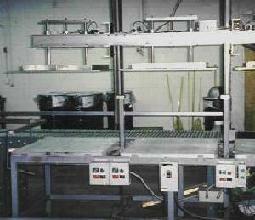 This also includes systems for web processing in vacuum chambers, including gas plasma systems. Please contact us for more information in regards to these unique systems.